I bought a new Toyota Tacoma from Durand Toyota in April of 2007. Along with the vehicle I purchased a Life and Credit Disability policy. 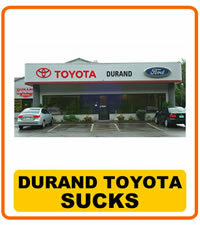 Durand Toyota is also known as the Durand Auto Group as well as Durand Ford Toyota. I paid the Tacoma off in July and I am still waiting for the refund on my Life and Credit Disability insurance. Durand Toyota sold me the policy when I financed the vehicle, but they claim they have nothing to do with the insurance. They have also stopped returning my calls. Monumental Investments, Durand Toyota's carrier for the insurance has yet to issue any refund for the unused portions of the policy as spelled out within the contract. Beware of Durand Toyota of Bellows Falls, Vermont.